Joy in the Journey: Time to Get Obsessed - Time for CHANGE! Time to Get Obsessed - Time for CHANGE! It's been awhile. I'm sorry. I wish I could say there was an earthquake that swallowed my house and disconnected me from the internet. I wish I could say I've been living in a monastery without access to the outside world. I wish I could offer up some *good* reason for not posting since August. All I can offer up is a BS explanation about work chewing me up and spitting me back out and me not wanting to do ANYTHING over the last several months. I work out so I don't break down at work (did that almost every day for about 2 weeks back in October after some "condensing" of our hospital's labor force), so that's something, I guess. Right? Somehow by some miracle I haven't gained anything since August. Has to be the working out and the not eating...NOT my recommendation for a solid wellness/fitness plan!! That being said, I have not been able to put my all into anything since Shift Shop (a phenomenal program, by the way!). I've dabbled here and there, but figuring out what to eat when and doing the prep work and not feeling challenged has left me uncommitted and unmotivated. Did I mention not wanting to do anything lately? I've been directionless. I've been miserable. And I've had enough!! Quite honestly, I had enough back in November, but I didn't have the tools to fight back in ANY way. But today? Today I have a new tool. Today I have 80 Day Obsession. Beachbody released 80 Day Obsession as a new program today, and it is just what I needed. Let's take a moment and examine just *why* this program is perfect for me, especially right now. Problem: I get bored easily. 80 Day Obsession is a series of 80 individual workouts. While the themes for each day of subsequent weeks may repeat, the actual workout is different. It was filmed sequentially with the cast from day to day. No repeats means no chance to become bored! Problem: Some trainers are annoying. 80 Day Obsession is the newest program from Autumn Calabrese - the trainer who brought us 21 Day Fix, 21 Day Fix Extreme, Kill Cupcake, and Hammer and Chisel (long-considered *my* soulmate program). I know I like her. I know I respond to her training style. And I know how to gauge my weight selection against hers. Problem: I am not a cardio fan. 80 Day Obsession does incorporate cardio, but it's FUN and innovative - using slides and mini bands to both target your muscles in new ways and to "distract" you from the unpleasantness of cardio. At least, it does if you're me. 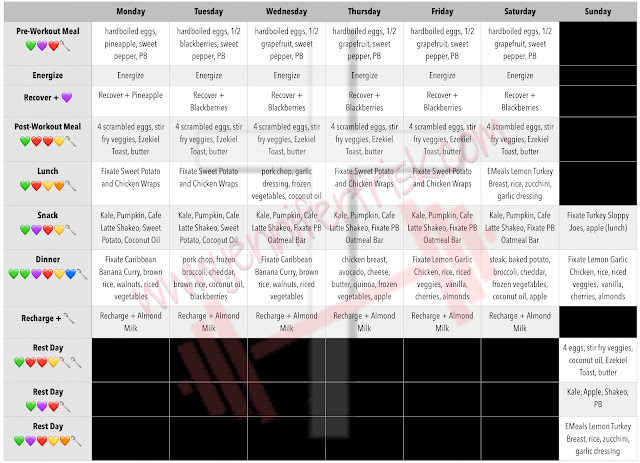 Problem: I am not up for figuring out a meal plan. Seriously, I need someone to flat-out tell me what to do. 80 Day Obsession tells you WHAT to eat as well as WHEN to eat and WHAT CONTAINERS to pair together. This is the single most important reason I am doing this program right now. My brain is fried every evening I leave work. I NEED simple. The other thing that I have with 80 Day Obsession? Fixate on BOD (Check out what I said about Fixate here.) Fixate has specific recipes that are appropriate for 80 Day Obsession with correct containers for each meal. Can it get any simpler than that? So here I go. Today is day 1 of week 1, and I am ready to go. I have my equipment, my Beachbody on Demand, and my meal plan. My alarms to eat are set on my phone. I have the tools; now it's time to implement the changes. It's time to get OBSESSED! What about you? Where are you right now? Are you happy where you are? Or could you use a little bit of help? If you could use a little kick, leave a comment below. Let's get obsessed together!